The S.S. United States is the fastest of the Great Steam Liners and a one of a kind piece of American history. The ship holds the transatlantic speed record for crossing in just over 3 days and has hosted many famous people, even carrying the Mona Lisa because of its speed and reliability. Built with 65% U.S. government support, the ship is 990 ft long and designed for 1,928 passengers and a crew of 900, but was also capable of carrying 15,000 troops. This historic ship was eclipsed by air transport at the height of service and was shelved in 1968 after only 18 years of operation. The ship changed hands several times but now sits idle in Philadelphia since 1996. Donations have kept the S.S. United States from being scrapped. But the ship needs preventative maintenance and refurbishment. In 2014 Inspectors for Crystal Cruses found the hull to be in good condition. (~5% wear. Regulations require less than 10% wear.) But it needs paint and corrosion prevention to survive. I think the 'United States' should sail again. It's a symbol of our collective work as a nation. And I believe that's worth saving. Before coming to Philadelphia, previous owners prepped the interior for refurbishment. The interior is metal framing intended for refit. Occasional walking tours are available for $150 to members. But google 'images' or youtube also offers a good tour. The S.S. United States is run by a small non-profit which gives about 70% of charitable donations to a marine terminal. Half of that goes to the state of P.A. which owns the dock. But none goes to maintenance. Its hard to say they are "preserving" the ship. In fact they are simply wasting the ship as a destination and a resource. And the ship looses about 300 lbs of metal to rust each year. Yet Divers found the hull to have only about .12 inches of wear. That leaves about .13 to go before it would be considered unsafe. But it needs paint to stop the corrosion. The non-profit "conservancy" sends about $60,000 per month, (about $10 Million so far). However, fundraising takes up virtually all their time, preventing maintenance, limiting return of emails or calls (except to high paying cash donors). They are run by a matriarchy, which is nice until you start talking about repairs or the condition of the ship, then they just start talking over you and hang up. As of December 2017 the "conservancy" began claiming that they have sold an option to RXR, a New York real estate firm. In reality they appear to have begun claiming RXR was involved in order to avoid any discussion of maintenance or use of the ship. The Real estate firm appears to have no experience in ship operations. And very few people understand or remember how to operate it. The new firm is said to "begin to explore options" for redevelopment. (which have been explored since 1969) So it looks like another impossible "for profit" scheme since they don't return calls either. Compare this to the S.S. John Brown, an older ship in Baltimore which is restored and run entirely by volunteer labor. They simply rolled up their sleeves and did it. They now sail that ship and accept visitors. The SSUS is not a building. It's a giant dock fee and a constant exercise in maintenance. The massive dock fee is like serving an 18 million dollar mortgage, PLUS the massive maintenance costs, which are even higher. There is no profit in a (gutted) 990 foot ship that doesn't carry containers, oil or people. So the ship sits idle at the dock. And its derelict nonprofit refuses to do anything but take people's money. Its present course is certain. It will rot and sink. If they don't call me they'll eventually loose the ship to the elements. By comparison, the John Brown's refurbishment began with a single ad in the paper. And a few dozen volunteers. It just needs to be done. But 'the management' can't delegate. 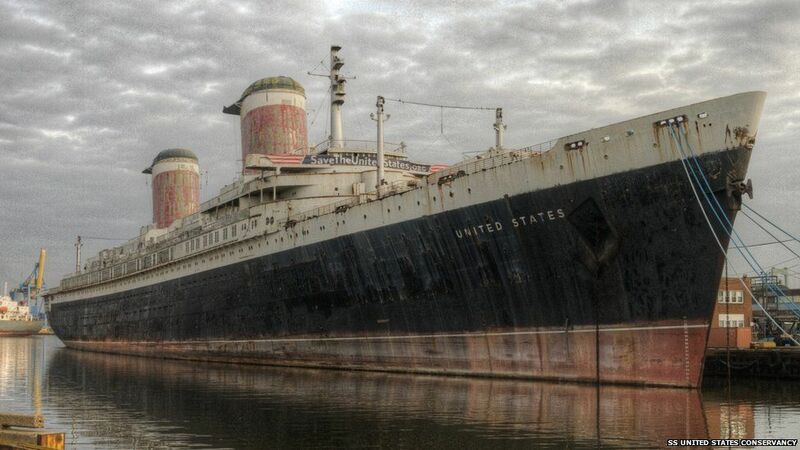 While RXR does 'develop' properties, the SS United States has been closely examined by "industry" experts for decades and no deal was found. It simply isn't a cruise ship, casino or shopping mall. It's a unique maintenance hungry asset. The ship needs an organizer, not an investor. But it's all girl management is so keenly tied to begging and lofty ideas of history, that any mention of the fact or metal of the ship provokes an immediate hang-up. Its just willful incompetence. I think the ship would make a fun national icon and an interesting day trip. I live in Philadelphia and have organized festivals with 50,000 dollar weekends. I am also an inventor. And the ship needs to be re-invented. Few people EVER invent anything. (Putting pretzels on your baloney sandwich doesn't count.) Inventing is dedicated problem solving that makes the difference. So far, the fundraisers have scheduled 'no maintenance' in 23 years. The ship needs to have people pay and use the space. I begged them to give tours. So they did. But they charged 1000 dollars per visitor ! A ridiculous thing. I pointed this out, so the next year they reduced tours to 150 dollars. Still ridiculously high. The ship needs a captain to plan its course. Not a committee. Committees recommend. Captains make decisions. The ladies seem to navigate the felicitous world of donors. But that's just dreams and pocketbooks. Its not helping the corroding steel. All the money appears to be pocketed in return for dock fees and continued fundraising. I asked them to give tours, they went half way. I asked them to lower the price, they went half way. I asked them to manage the ship and they went half way, with an out of state firm that doesn't appear intended to do anything. Even philadelphia's dilapidated prison museum, Eastern State, brings in hundreds of thousands of visits per year. Its hard to imagine why 'the conservancy' abandoned the actual ship. They have shown they can give tours. But they appear to "feel" that the ship is just too precious for the public. They complained that they're were out of money, So I sent them several high value donors. They haven't complained about that lately. But there is Zero progress. The ship has sat idle for 23 years rusting instead of earning money, turning away visitors, ignoring the volunteers and doing no maintenance. Is steve jobs hiding out at RXR ? There are only a few low paid jobs to be had. So nothing will happen until they forget the get-rich-quick schemes and learn how to do preservation. It takes more than cash to make it work. There is knowledge, labor, materials and good will.. then we can talk money. If they were selling VanGough's portrait of sunflowers they would get tens of millions overnight. But they aren't offering anything people want. They live in a world of free donations. Free money. So they wasted last years dock fees, excluding tours and labor. The dock fee is to keep the ship there for just that sort of thing. The ship doesn't earn anything, can't be reached and is a long way from profitability. It needs visitors and tens of millions in paint and service. But it's still floating. So donors keep giving. I think saving the ship is tantamount to saving America. The "conservancy" represents everything wrong with America. Crazy hang-up phone emperors, incompetent management, bad decision making, Neglect. The ship is vastly more complicated than begging for dollars. Oversized historic properties tend to get vandalized by those who control them. They sell off things that are important, (like the Ship's missing propellers) They chew like mice into the packaging, (the damaged aft railing), they make half-harted repairs (the conservancy once tried selling square "inches" of the ship). In the end it takes a dedicated individual to restore the damage from lack of comprehensive planning. Let's see if they're willing to Make the 'SS United States' Great again, without further abusing the historic vessel. Did they give the ship to a woman to prove a point? I think it's proved. The S.S. United States needs a renaissance statesman, a technologist, with product development, marketing and engineering experience. It takes careful planning, media management and new methods of coordination. I do that. But you can't just tell a non-profit what to do, they would go half way and be lost. (And that's what happened, Giving tours, but only for 1,000$, Lowering prices but only to 150$, Hiring a management company before there's a way to run the ship.) Even the the laudable and vital fund raising is only half way. Just enough to let the ship rot. I guess that's why I'm interested. It's the kind of problem I solve. The Ship needs a leader. Is the candidate familiar with American Heraldry? Steam Tables? Organizational Dynamics? Methods of Architecture? Product innovation? Publicity? Good will? It takes all skills. And you never know which one will solve the next problem. I think others would enjoy lending their knowledge and effort to the task too. But they need a leader. The fundraisers live in the world of perception. It's fun to daydream about the ship's history. For a minute there I thought we were billionaire industrialists sailing around the world. More steam Wilson! But now, back to painting the decks. The SS United States can only function correctly if it's managed for the right reasons. Social, Historic, Economic and Spiritual. It takes 'all domains' of knowledge. It's what I do. In a way even the SS John Brown is a business. A few paid staff, but volunteers get what they put into it. That's a good deal. Giving cash for a dream is good too. But it will fail without help. None of the donors have had the 'cash' to make the ship a private venture. It's just too much investment AND overhead AND maintenance. So the ship sits idle. The ship must open to the public. But a buddy-buddy network can't open to the public. Because the public isn't their "buddy". So they can't delegate. I have worked those matters out. Just need to get the conservancy * to begin returning phone calls. They will talk to you as long as you dont mention important things. But why would they, when people give them money for a dream. More champagne Wilson! The S.S. United States is the perfect image of America. It's a great advertizement for the docks and the Delaware Valley. It could create trade, promote the city and inspire the nation. The people have the unused piers to make it possible. I developed a tentative deal for a low cost pier. But someone always smells money and the waiting game starts over again. The Ship cannot fulfill her original purpose as a passenger liner because air planes are fast, Cruise ships have different structure, and container ships are specialized vessels. Yet the SS John Brown found a limited market. Preservation requires using what's there. With the right leader, the Ship can generate a strong involvement from the public. And that resource will become available for maintenance. Sustainability is vital. Once the ship is functioning,(bringing in visitors) the nation could easily chip in a penny per citizen. The alternative is to bilk the public for a dream which sinks from neglect. The S.S. United States needs a new purpose. That must be designed, just as the ship was designed. It requires an exceptional, multi faceted talent, long term skill and commitment. But those problems are solved. What remains is to get the parties to recognize that they have a resource, and must engage the leadership to develop it. They have opertunity, but must satisfy the public to acheive it. The S.S. United States will need a separate full time office of management for the ship - not just fundraising. It needs a unique champion. It needs an organization. And they need to return phone calls and emails. It's fun to do something for the future. And the S.S. United States could be fun and enriching for the community and the future. Something more than a rusting debacle. I see it as a place people can visit, contribute, learn. And learn we will. With so much going on, I hope you will send a message of support. What are America's historic symbols worth to future generations? What is your voice saying? A nickle?, 5 dollars?, 500,000? Give what you can. If you're interested or took the time to read, email to say hello. Click to chime in. Set "quantity" for amount.